Carla’s clever husband gave her one for her birthday. She fired it up for our Bollywood evening, featuring Chhupa Rustam. Posted on June 5, 2008 at 11:35 am in Hindi movies	| RSS feed You can skip to the end and leave a reply. Ha! you would have to say something very very very awful for me to ban you. 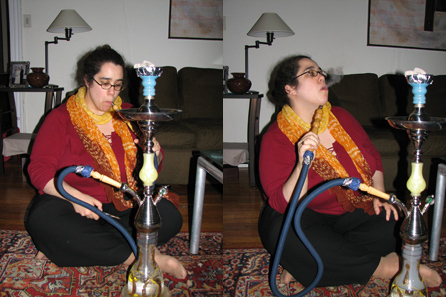 I don’t smoke (except occasionally a cigar while playing pool, I am soooo feminine) but hookahs are cool. It was quite pleasant although I probably won’t make a habit of it (except on FilmiMem Bollywood evenings). Carla had cherry-flavored tobacco (her husband asked for something more grown-up next time LOL) and it was very mild unless it got too hot. There’s an Indian restaurant in Back Bay that has hookahs for people to smoke as a digestif, I suppose, but I never got around to it. Ahh, I used to be a hookah addict. Thankfully I’ve left my hookah on the other side of the world, hence I can’t slowly cancerfy my lungs even if I want to. It’s so lovely. We should have a Bollywood hookah night. Your petite exhalations bespeak your noviceness; I can show you guys how to blow massive smoke rings. Yeah! Ooh! A fun thing you can do with hookahs: fill the base with things like iced coffee, juice, or even alcohol (though I’ve never tried that, for fear of having the hookah explode on me) instead of water. I so want to blow smoke rings like Pran, but likely never will. I can’t even blow bubbles with bubble gum. Carla was making a good stab at it though so maybe you can help her along. Though it’s an ancient “practice” originating in India, hookahs are something almost every Indian, Arab and Persian have in their parental homes whether they smoke it or not. But due to its increasing popularity in the West as a “exotic” novelty item, I suppose it’s currently on every stoners’ wishlist. Oh my gosh, very Memsaab in Wonderland! Or should it be Bollyland? PPCC, I am still learning how to manage the heat properly to get massive clouds like the boys (and oh yes they are all boys) on the hookah forums do. They display pictures of themselves shrouded in thick white clouds with a pride that says “mine’s bigger than all a yours” in a way that only boys can. I am madly in love with my hookah but I have smoked it a grand total of only 5 times and still have loads to learn. I’ll take any advice you can come up with! My next point of experimentation will be to use colder water; I’ve read that helps for thicker clouds. 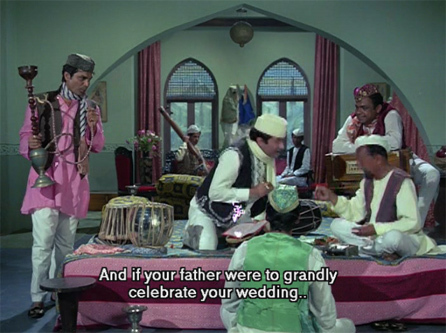 And meandering closer to topical-like, I have to say that hookah and Hindi films go really, really well together. Highly recommended for all. ajnabi: carla and david (her husband) and I also commented on the Alice in Wonderland aspect of it all :-) it’s part of the charm! Shweta: I choke on cigarettes but this was much milder. I love Chhupa Rustam, can’t wait to read your take on it. bollyviewer: yes, we need cushions, and we need young cabana-type boys waving palm leaves or peacock feathers over us. 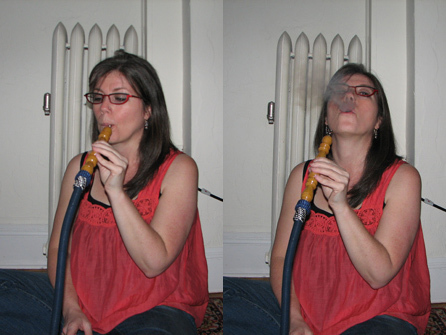 And Anonymous (sorry, you went into spam for some reason): why not women smoking hookahs???? I don’t think either Carla or I qualify as stoners (although I’ll let Carla answer for herself) although we are definitely women. In India, it’s usually a male thing. Women smoking in general are considered “lower-class” in India. There was a recent BBC documentary, Women in Black, which briefly talked about how some young Arab women would escape to certain places to secretly smoke hookahs etc as they’re highly criticised for doing so confidently in public – it’s the same situation for Indian women as it’s considered “unlady-like” and “lower-class”, so that’s why you’re more likely to spot a working-class Indian woman smoking a hookah, beedi etc than a middle-class woman. Have you tried smoking a beedi, by the way? There are many people here in the West who are using it as bongs! Lol, I’m not suggesting that you are using it as one too. Beedis don’t even tempt me, they are too acrid…and remind me of clove cigarettes, which just make me gag. My sister might have tried them though! Are cigarettes considered a lower-class thing for women to smoke too? Yes, cigarettes too, but more and more modern Indian women nowadays are taking up smoking probably because of freedom of choice as the gender roles are slowly eradicating. Yes, your sister has tried beedis, interesting but I like my camels better. Now you know why I smoke, the wish to envelope myself in clouds of fantasy. Great hookah scenes in ‘The Chess Player’, mainly the two men of course although Shabani Azmi looks as if she really enjoys it too. Carla’s hookah awaits you, too! The colder the water (or any liquid in the base), the easier it will be to get a long pull (for lack of better descriptive phrase!) and not make your throat suffer too much. Also, I always found that Maximum Cloud Capacity would occur about halfway through my charcoal. At the very beginning, it was still too rough and hot. Blech. At this one hookah bar I used to go to, the waiters were great because they would smoke the first few puffs (which are typically the super-strongest and lamest) themselves. Re: women smokers, generally. Doesn’t Umrao’s boss lady in the old Umrao Jaan smoke up a hookah storm? I seem to recall her constantly lazing around and puffing on it. I think Umrao’s boss would not qualify as a lady, to Anonymous’ point. Of course not! I know many occasional smokers and people who smoke with others because (and I quote from a friend) “it’s a social thing” – they can possibly quit anytime but chooses not to. People never start smoking because they’re addicted! Anon: that comment was directed at my sister, who has been smoking for decades…she’s addicted! Although it is true that I wasn’t when I started. And I would try harder to break the addiction if I didn’t enjoy it so much. Lol, whoops. I think you should delete it. Has somebody ever gotten hold of a “combination hookah and coffe-maker”, that is referred to in the opening scene of Walt Disney’s “Aladdin”? Nothing better, from my point of view, than a smoke with a cup of coffee! Well, with a cigarette, that is. I stand in awe in front of people wanting to bubble their way through an actual hookah!